A Round Rock, TX transformation nestled among the beauty of the trees. These Round Rock, TX homeowners have one of the most beautifully lush backyards. Being able to incorporate an outdoor living structures within this backyard could seem like a challenge to some, but not to us. The mingling of the wood and flagstone we used to create this outdoor retreat is mesmerizing set against the beauty of the rush of green in this residence. 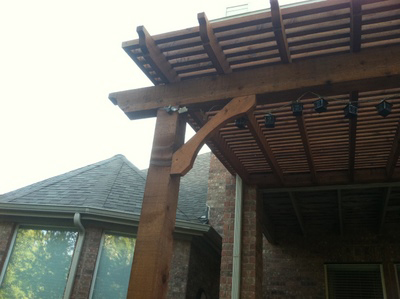 This Round Rock, TX pergola is used as a patio cover for the upper portion of the Flagstone patio. These homeowners had an existing concrete patio that was not serving their needs. 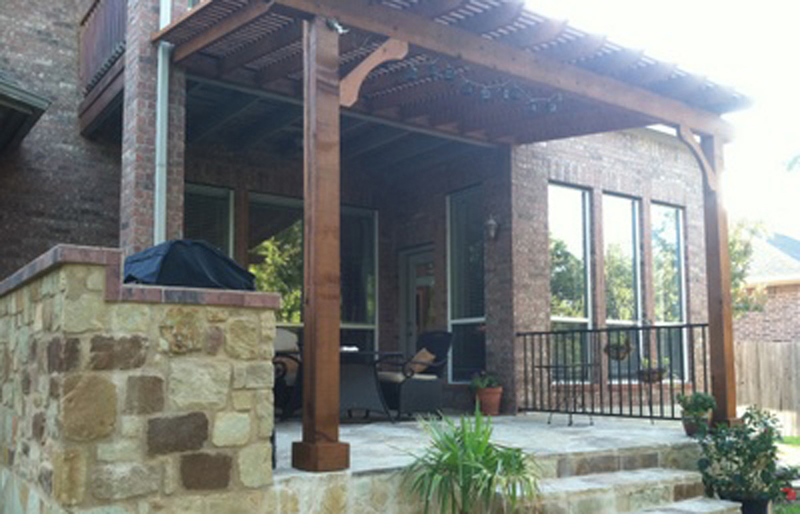 Our goal was to extend the patio and pour a whole new facet of enjoyment into their backyard. Our design included a covered patio extension complete with an outdoor kitchen and pergola-style roof and another patio that descends from the covered patio to the new outdoor fireplace. In designing the master plan to transform this Round Rock, TX backyard into a paradise for the senses we first had to overcome some obstacles. The first challenge was to incorporate all the desired structures into the homeowners minimal backyard and also deal with the small elevated back porch. The design we decided upon that would work best was to actually create two structures out of one area by extending the small space to make it larger and adding another space to serve as the focal point for the outdoor fireplace. We designed an extension of the existing concrete patio and added stone over the top of the concrete for seamless design. We then added the pergola with an extension as well over the patio and added a little slope to compensate for the existing patio being so high. The small round patio located in the design accents the large outdoor fireplace located at the corner. We used a round design for the patio and continued the curved design feature into the fireplace’s eyebrow and hearth. The medium we chose to cover the patios with is gorgeous Oklahoma flagstone in buff peach. We also used block stone in the design using Autumn blend block stone. The element of the two separate stones working together along with the cedar pergola and the trees on the property is truly breathtaking. Archadeck of Austin custom designed this cedar cabinet located above the mantel of this outdoor fireplace to safely and efficiently house a TV. The outdoor kitchen is located inside the patio cover and includes a grill, refrigerator and plenty of electrical outlets. The countertops are finished out with a very nice tile that compliments the homes brick colors. 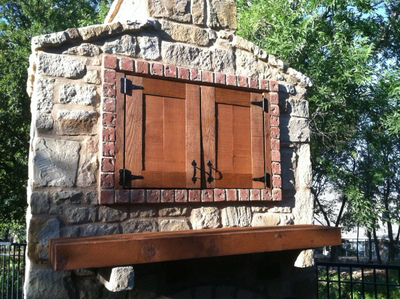 The rustic outdoor fireplace is graciously equipped with custom cedar cabinets above the firebox made especially for housing a television and keeping it safe and dry from the elements. Here is a slideshow of this Round Rock, TX backyard oasis that is a feast for the senses…. This entry was posted on October 12, 2011 by austinporchandpatio. It was filed under Austin outdoor kitchen, Austin outdoor stove, Austin patio cover, Built-ins, Covered patio Austin, Covered Patios, Flagstone, Flagstone Patios, Materials, Oklahoma Buff Peach Flagstone, Outdoor fire place, Outdoor Kitchens, Pergolas, Professional Design Rendering, Western red cedar and was tagged with Archadeck of Austin, Austin Cedar Pergolas, Austin covered patio, Austin covered patio deck, Austin flagstone patio, Austin Oklahoma Buff Peach flagstone patio, Austin outdoor fire place, austin outdoor fireplace, Austin outdoor kitchen, Austin outdoor room, Austin patio builder, Austin pergola, outdoor fireplace, Outdoor kitchens Austin TX, Round rock Oklahoma buff peach flagstone patio, Round Rock TX flagstone patios, Round Rock TX Oklahoma flagstone patios, Round Rock TX outdoor firplaces, Round Rock TX outdoor kitchens, Round Rock TX patio covers, Round Rock TX patios, Round Rock TX pergolas.